*"Hollywood Beach" (1st) was one of the three unique "Sun Room" 5DB buffet lounge sleepers constructed in 1956 by P-S for SAL. As a side note, the "Hollywood Beach" (1st) is the only one of the two surviving "Sun Room" sleepers in regular charter service. The "Hollywood Beach" (1st) had been renamed to "Sun Ray" also in 10/1967. I remember seeing one of the Sun Room cars at Washington Union Station in the early 1970s and "Hollywood Beach" was mentioned briefly in the Nippert/New Georgia thread. Can anyone provide more history and a current status of these cars? The Hollywood Beach has been privately owned and used in the Tennessee Central Railway Museum trains out of Nashville, TN. I'm not sure it is still there, however. Another of the three cars used to be part-owned by Les Kasten of Illinois Transit Assembly Corp. (ITAC) fame. The car was once for sale, but I don't have any current info on the car's whereabouts or status. It had been smooth-sided which gave it a completely different appearance compared to the as-built Hollywood Beach appearance. The other car was scrapped. These were originally called "sun lounge sleepers" and were built for Seaboard Air Line Railroad. Named Hollywood Beach, Miami Beach and Palm Beach. The "Hollywood Beach" was not slab sided. As of this writing, it is on the rear of Amtrak #7 (Empire Builder) accompanied by ex- Milwaukee Road biz car "Wisconsin". They are headed to Seattle to join the annual AAPRCO convention train, this year being held in Napa Valley. Thought I'd provide some clarification concerning the "Hollywood Beach". There were in actuality two different Seaboard Air Line sleepers to carry the name "Hollywood Beach", and this also true for "Miami Beach" and "Palm Beach". The first three sleepers to carry the "Beach"-series names were indeed the unique "Sunroom" 21 seat lounge 5 double bedroom sleepers constructed in 1956 by P-S in Lot #6970 to Plan #4202. These three cars were renamed from the "Beach"-series to the "Sun"-series in October 1967. SAL #18 "Miami Beach" (1st) renamed "Sun View" on 10/13/67. SAL #19 "Palm Beach" (1st) renamed "Sun Beam" on 10/11/67. SAL #20 "Hollywood Beach" (1st) renamed "Sun Ray" on 10/20/67. The reason the three "Sunroom" cars were renamed from the "Beach"-series to the "Sun"-series was to free up the three "Beach" names for the three sleepers originally in the "Mountain"-series. These were 6 double bedroom buffet lounge sleepers constructed in 1949 by AC&F in Lot #3045 to Plan #9003. These were also renamed in October 1967. SAL #15 "Red Mountain" renamed to "Palm Beach" (2nd) on 10/19/67. SAL #16 "Stone Mountain" renamed to "Miami Beach" (2nd) on 10/17/67. SAL #17 "Kennesaw Mountain" renamed to "Hollywood Beach" (2nd) on 10/20/67. SAL #20 "Hollywood Beach" (1st) to "Sun Ray" to SCL #6501. To Amtrak in 1971 as #3231. Retired 10/1981. 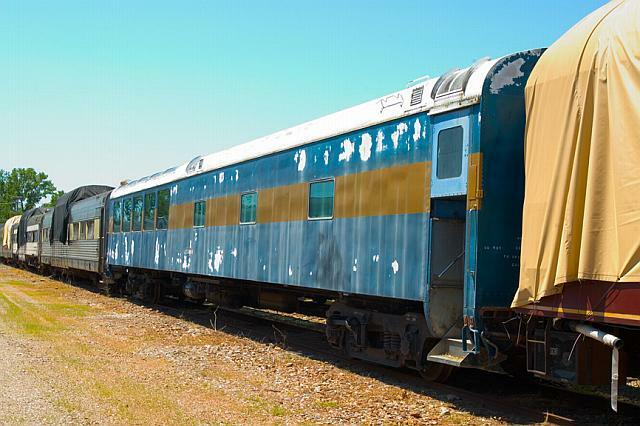 Sold to Southern Classic Train Cars. Leased to the Broadway Dinner Train. Sold to Lancaster & Chester. Amtrak registration #800129. This is the car that is in regular charter service and is currently westbound on the Empire Builder headed my way. This is also the car featured on the Tennessee Central Railway Museum website. SAL #17 "Kennesaw Mountain" to "Hollywood Beach" (2nd) to SCL #6600. To Amtrak in 1971 as #3220. Retired 7/1981. Sold to Al Nippert-Gator Rail Tours. To Tennessee Valley Railroad Museum. SAL #18 "Miami Beach" (1st) to "Sun View" to SCL #6502. To Amtrak in 1971 as #3232. Retired 11/1977. Sold to Mike Gresham. To Les Kasten-Illinois Transit Assembly. SAL #19 "Palm Beach" (1st) to "Sun Beam" to SCL #6500. To Amtrak in 1971 as #3230. Retired 7/1981. Scrapped at Naparano Iron & Metal Company in Newark, NJ, sometime in the 1980's. SAL #15 "Red Mountain" to "Palm Beach" (2nd) to SCL #6602. To Amtrak in 1971 as #3222. Retired 1978. SAL #16 "Stone Mountain" to "Miami Beach" (2nd) to SCL #6601. To Amtrak in 1971 as #3221. Retired 1979. I think that just about sums it up! I hate to through a monkey wrench into the machinery but we traded the Hollywood Beach (2nd) to Les Kasten. Not sure where it went from there. I did not intend to infer that Hollywood Beach had been slab-sided, and the link I posted obviously shows the car with the stainless fluting. (I've seen, photographed and been through the car, BTW.) I just couldn't recall which of the other two cars had been scrapped and which was owned by Les Kasten. From subsequent postings we now know it was Palm Beach that was scrapped and Miami Beach that was slab/smooth-sided and wound up at ITAC. Now, when the removal of Miami Beach's stainless steel siding took place I don't know. Anyone know if it (the Miami Beach) still exists? It (the Miami Beach) was for sale at ITAC 10+ years ago at a rather kingly price, and it was not much more than a shell with (supposedly) new HVAC system and new glass; the interior was bare (correction: see description added below.) Here is the Miami Beach at ITAC in May 2007. Miami Beach, former SAL 18, ex-SCL 6502 "Sun View", built by PS in 1956 as 5 bedroom, buffet, 21 seat lounge. Was originally fluted, now paint smooth stainless. Has all new FRA glazing to include emergency windows. ISH trucks with disc brakes. D-22 airbrake. Underside stripped except for water tanks. Car needs interior work and side sills. Bedrooms mostly complete. The car comes with 2-Amtrak HEP a/c systems (16 tons total) plus other parts. Remember, this is like a low-level dome that can go all the way up the NEC! Three were built, two remain. The Hollywood Beach was done here at ITAC about four years ago. We are entertaining offers for this ultra-rare car at this time. On 5/22/02 in discussion with Les Kasten of Illinois Transit Assembly Corp. (ITAC), half owner of this car, he said he and his partner will take $143,000 for the car, which will include everything they have to put on the car including $40,000 in glass. It is intact with all hardware, but needs side sill work. The car cannot be returned to smooth stainless because it has been sandblasted, but could put all new stainless on car if wanted. The Miami Beach was in the Syracuse area in 1989/1990. I spotted it on a trip to the area at that time. It later sold to a fellow in the Bellvue, Ohio area I believe before moving on to Kasten. When I saw it in Syracuse it was slab sided then. Moving ahead, I think it was still at Gateway when I was there earlier this year. Based on what I've seen and Les' description, I'd say it was a car with great potential. Not real sure about the $143K though. Tim, I like your idea for a Les Kasten roster, but that may well be "a bridge too far". I'd guess that not even Les would have all the info. Went down to King Street both Saturday and Monday in an attempt to take some photos of the "Hollywood Beach", but so far I've struck out! Saturday, the MILW business car "Montana", which came west with the "H.B. ", was at the platform, but the "H.B." was being elusive! I would've checked the coach yard, but I to be across town, so I didn't have the time. On Monday, the now-long line of PV's was tucked in between two generations of Talgo Cascades trainsets, the afternoon departure on one side, and the brand new, not-yet-in-service "Mount Jefferson" set on the other! Thankfully, I was able to get photos of the "Two Rivers" (see the New Georgia thread for the history of this ex-NYC sleeper), and the CN "Burrard". Also on site was the NYC #3 "Portland", MILW "Wisconsin", AT&SF "Vista Canyon", and DL&W #98 "Federal". Arriving Monday night on the Coast Starlight were the CN "Scottish Thistle", UP "Pacific Sands", CN "Tioga Pass", UP "Pacific Sunset", SP "Virginia City", and CB&Q #377 "Silver Solarium". Expected to arrive via the Builder are the SLSF "Caritas", UP "Berlin", CGW "Dearing", GN "Puget Sound", and CB&Q "Sierra Hotel" travelling together, followed by the BAR #100 "Suitsme" travelling with the C&EI "Promontory Point". Also possibly headed north is the C&O #3 "Chapel Hill". I'll make another try tomorrow-this time I'll try and make it down there in between Cascades arrivals and departures! To follow up on the cars gathering for the AAPRCO convention in Seattle, today I made another trip down to King Street Station. The eight cars that had been at Platform Six yesterday had moved into the coach yard, and another string of eight cars were laying over on Platform Three, directly across from the commuter (Sounder) platforms, allowing for an unobstructed photo-taking opportunity. In order, the cars were UP "Northern Dreams", UP "Northern Sky", SP "Birch Grove", CB&Q #558 "The Observatory", CN "Oliver Hazard Perry", C&EI "Promontory Point", BAR #100 "Suitsme", and GN #1196 "City of Spokane". One of the last arrivals will be C&O #3 "Chapel Hill" tonight on the Coast Starlight. The train is being assembled in the coach yard for the early Thursday morning departure, so when I go back down tomorrow I'll be taking pictures from the Martinez overpass and the Holgate at-grade crossing. That is a grand total of 28 cars that have gathered for the convention. I've posted a video on YouTube which features a nice look at all of the cars, including Hollywood Beach, as the train rounds a curve in Auburn, WA. The train's moving fairly slowly, it's not just flying past at 60 mph. I've also added the car names to the video for easy reference. Is Suitsme still owned by the Plymouth & Lincoln? The "Suitsme" was sold to Robert E. Owen and Terry Peterson in 2011, who own Zephyr Rail Services, and the car is operated under Pullman Railtours LLC. From subsequent postings we now know it was Palm Beach that was scrapped and Miami Beach that was slab/smooth-sided and wound up at ITAC. Now, when the removal of Miami Beach's stainless steel siding took place I don't know. Anyone know if it (the Miami Beach) still exists? It (the Miami Beach) was for sale at ITAC 10+ years ago at a rather kingly price, and it was not much more than a shell with (supposedly) new HVAC system and new glass; the interior was bare (correction: see description added below.) Here is the Miami Beach at ITAC in May 2007. 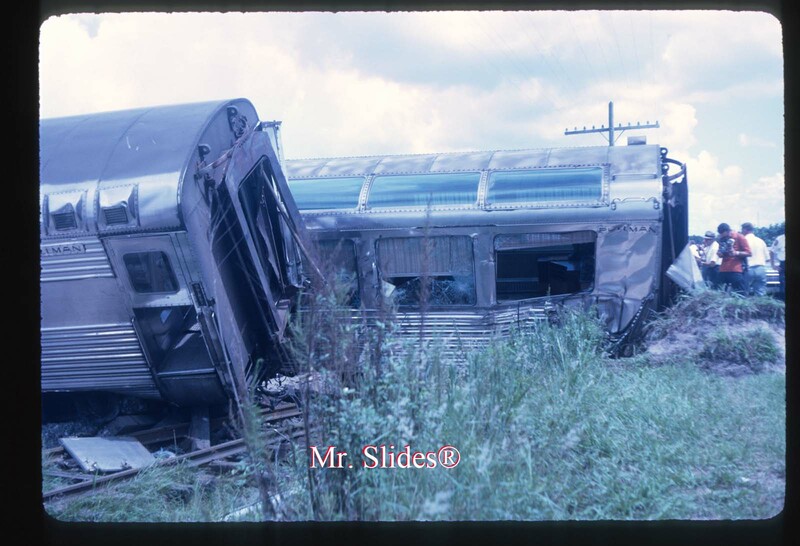 While looking through closed Ebay auctions, I came across this slide from 1968 showing 1 of the 3 Sunrooms involved in the wreck at Winter Haven*, FL, on October 6th, 1968 (first link and photo). *Randall lists the location as Winter Haven, the Ebay seller (Mr..Slides) lists the location as Eloise. Now, because the Miami Beach (1st)/Sun View is now slab-sided, I'm thinking this was the Sunroom involved in the wreck, and that the slab-siding was done by SCL as part of the repairs. 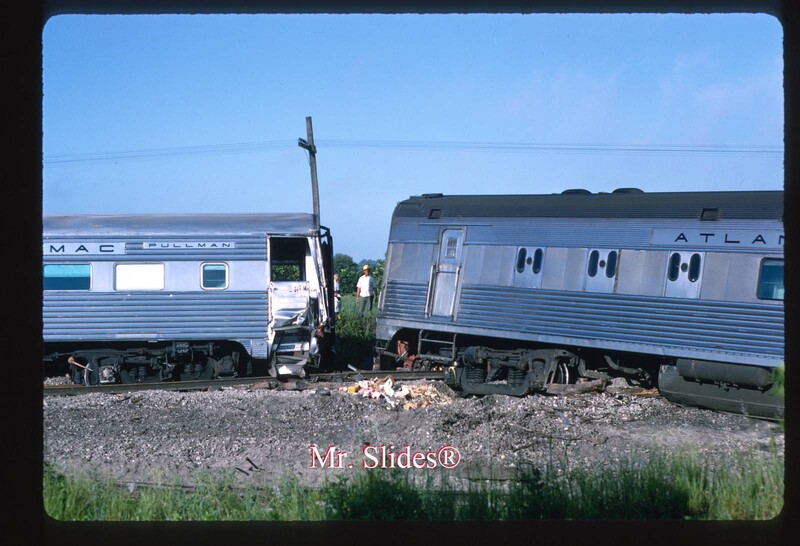 This was the same wreck that resulted in the retirement of RF&P 10-6 sleeper Essex (P-S, 1949) and ACL/SCL diner #5924 Orlando (built by Budd in 1947 as diner-lounge St. Petersburg, reconfigured to diner in 1952). A slide of these 2 cars was also recently for sale (second link and photo).